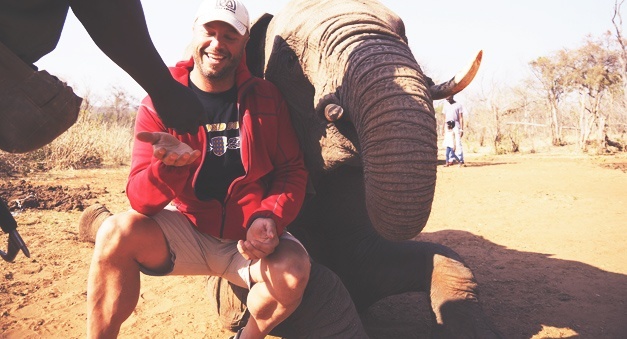 Self-Guided "Fly & Ride The Southern Africa Experience"
Contact Eric About Your Self-Guided Moto Adventure in Africa! 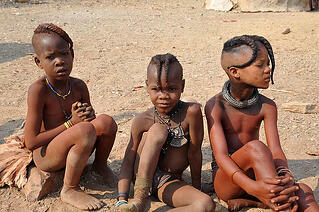 Desert Adapted Elephants, Petrified forests, Himba Tribes, history and stunning beauty! 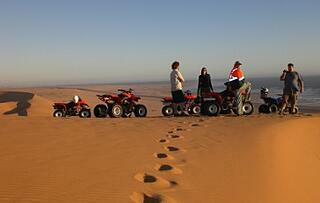 Riding the Skeleton Coast of Namibia on the bike of your choice, an experience few can claim, and none will forget. Swakopmund, where you will have the opportunity to experience the Adventure Capitol of Namibia in whichever way you choose! Sesriem Canyon and the dunes at Sossusvlei will leave you in awe and wonderment of the beauty all around us, formed so impressively by mother nature herself. Orange River and Fish River Canyon, a visit to Southern Africa wouldn't be complete without seeing these two landmarks. 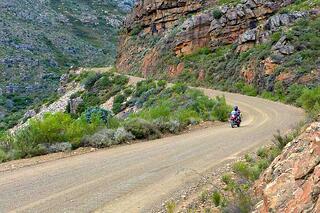 The Cederberg with it's twisty roads, stunning views, and unimaginably beautiful wineries. Table Mountain, recently innagurated into the New 7 Natural Wonders of the World, a sight you won't want to miss! Terrain Type: Approximately 25% paved / 75% hard-packed gravel with sections of loose/thick sand, or deep sand/gravel being possible. Particularly in Namibia, where they use an "A, B, C," type of road grading system, the conditions are often changing and unpredictable based on wind patterns, rain, etc. 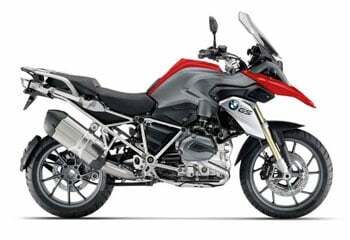 Regardless, this trip is only recommended for experienced adventure riders who are comfortable with such motorcycles in almost any variety of terrain. 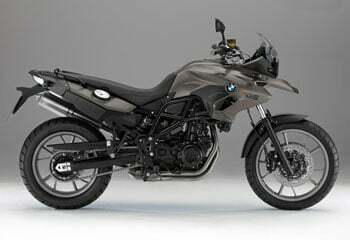 For those "Lone Wolf" types of motorcycle riders, or those who prefer to just go with a few friends, this trip pacakge through Namibia and South Africa very easy to take advantage of. With any of our "Fly & RIDE" tour packages, riders basically just need to show up with their riding gear, and we've taken care of the rest for you! 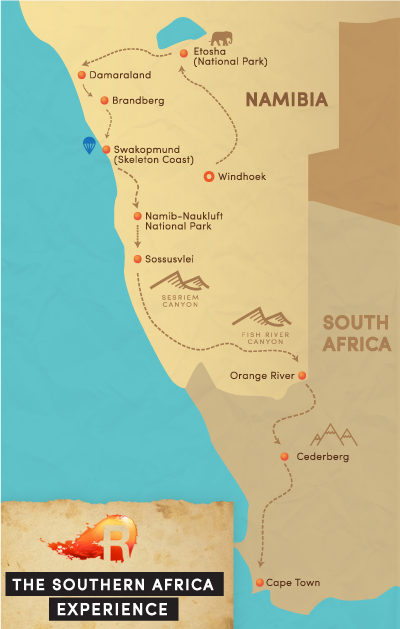 Starting in Windhoek, this route is designed to incorporate the best of the southern and northern Namib Desert, Etosha National Park, Central Namibia, and the highlights all the way down to Cape Town. 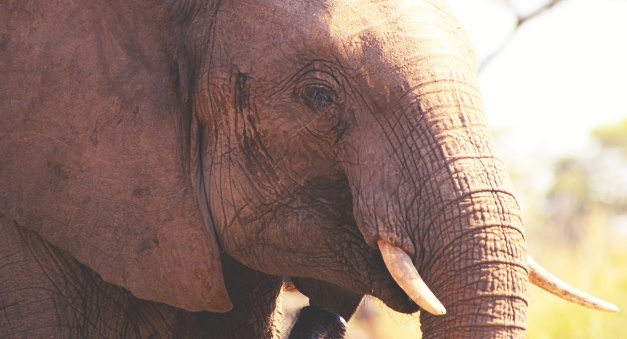 The route takes goes through areas well known for Desert Adapted Elephants, and geological folds of the ancient Damara Mountains. 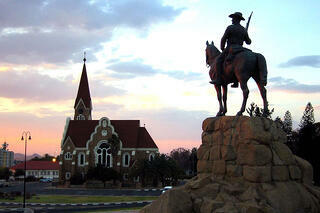 The Bavaria-styled adventure town of Swakopmund is part of the trip, and a welcome mid-tour break from the desert. You'll traverse the mighty ochre-ruby dune fields of Sossusvlei and discover the stunning rock formations of Sesriem Canyon. The striking Namib Naukluft desert scenery, undulating vermillion hills and ruby dune fields all lead to Aus and amazing views of the Fish River Canyon on the way to the Orange River. From there it's through Namaqualand, Cape Leopard country in the Cederberg Mountains, and on to Cape Town. Rounding out the trip with a must do excursion out to Cape of Good Hope, and around Table Mountain National Park via Chapman's Peak Drive. Sound like a lot to do and see? It sure is, but again, this Fly & RIDE package makes it easy to enjoy! 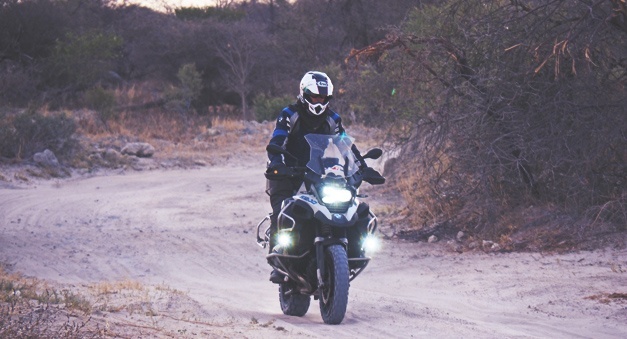 Your African motorcycle adventure begins with an arrival in Namibia's Capitol city of Windoek! While riding through some of the more rural settings across the African landscape might be the ultimate goal here, starting in such a city will still make for a welcome departure point. The city of Windhoek was established during the mid-1800’s by Nama settlers from South Africa, and their influence still resonates from deep within the city. With a distinctly continental feel and a far more civilized infrastructure than other parts of the country, this picturesque town of Windhoek is encapsulated by low hills under a hot desert sun. With one of our favorite hotels awaiting as part of your package, all check-in procedures pertaining to the bike rental will be clearly communicated to make this "Fly & RIDE" experience as easy and fun as possible. Sleep well tonight, and store up some energy for the incredible experience ahead. This is it ... the moment yourself and so many other riders from around the world have been waiting for! You're alone on in this trip format though (see "Fully Guided" version of this tour route here,) or hopefully with some friends that have joined your riding adventure. 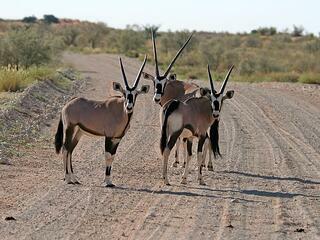 With a start by heading North after breakfast, plan on following Namibian B and C roads into cattle country. Riding through the quaint town of Omaruru, where the local Otjiherero language translates Omaruru to ‘bitter milk’, as the cattle used to graze on a local bush that turned their milk bitter. Your first stop of the day might be at the Kristal Kelleri winery for a quick look and coffee break. Afterwards the route takes you through to Outjo in the Cunene region and a first location to rest just outside the park. Awaiting you inside the National Park and surrounded by moping trees, an inviting swimming pool and ample character will make for a welcome site. Continuing with the theme of Etosha as being a ‘Place of Legends’, the lodge takes you a step further by bringing home the story and spirit of Africa…and the result is - legendary! 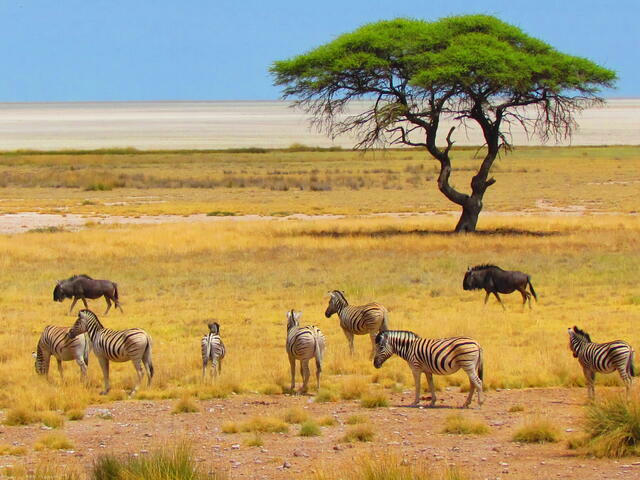 While it might seem early to have a Rest Day, there's still plenty of riding ahead, so it's okay to focus on the wildlife, of which there is plenty to see in the beautiful Etosha National Park. The ‘Place of Mirages’, ‘Land of Dry Water’ and ‘Great White Place’, Etosha is an incredible, seemingly endless pan of silvery-white sand, upon which dust-devils play wildly and mirages blur the enticing horizon. The sand shines throughout the dry season when enormous herds of animals can be seen starring in some of the most startling and photogenic safari scenery in all of Africa. Riders will have the opportunity to explore the National Park with experienced guides who know all of the best watering holes along with the animals who visit them. Your introduction to African wildlife will take place from the seat of an elevated safari game vehicle, accompanied by these seasoned guides! Early mornings or late afternoons are the ideal viewing times, and your chance to see some or all of the Big Five animals of Africa. After your dose of Etosha enchantment, return to the lodge and dive into the cool waters of the swimming pool before we meet do dine under a dome of stars on the veranda. Imagine watching the blazing African sun fall gracefully from the sky, sinking slowly into the landscape before you…that is how you’ll end your last night in Etosha, and then the motorcycle adventure continues! 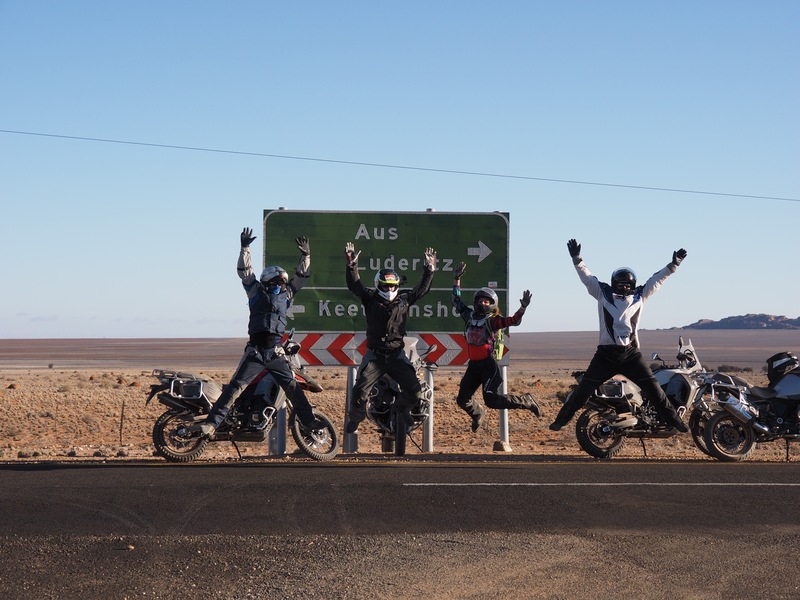 Today marks the start of more westerly riding, toward the north-central part of Namibia where you'll be surrounded by vast desert plains, ancient valleys and the awe inspiring Brandberg Mountains in the distance. This expansive, untamed, and ruggedly beautiful region offers quite a unique cultural and adventurous experience. Stopping near the small town of Kamanjab to visit a neighboring Himba village and a Cheetah Rehabilitation center is an option for riders. 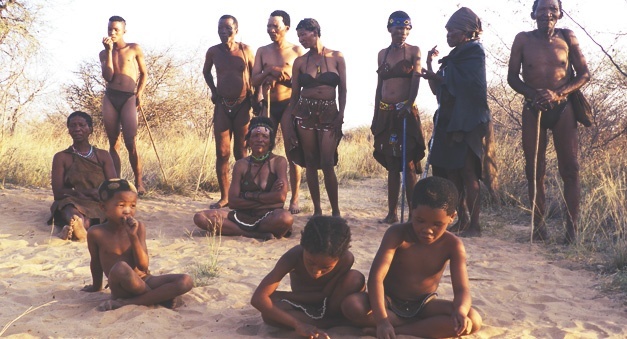 This opportunity to interact with the ancient indigenous tribe of Himba people is a rare experience that few travelers will be fortunate enough to have. 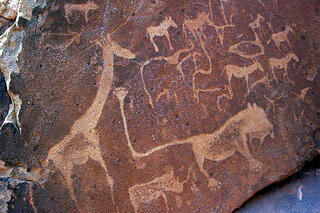 From Kamanjab it’s further West to the lodge on the Uniab River in Northwest Damaraland. Waving palms can be heard whispering in the wind with spectacular surroundings which harbor the famous desert elephant, the rare black rhino, giraffe, zebra, gemsbok and many other wild animal species, all which lie underneath sunsets you’ll be dreaming of months after. For those with extra energy to burn, there are some well laid out walking and running trails to allow your own discovery of the surrounding area, or you can relax under the palm trees at the resort swimming pool. Today's RIDE between Palmwag and Khorixas should include a stop at the petrified forest. This remarkable site is located in a dry riverbed where about 200,000 years ago a forest was washed downstream. Over time the tree trunks have fossilized and turned to stone, creating this magnificent and awe inspiring petrified forest. Growing amongst the logs are number of welwitschia plants, which are living fossils as they can live for more than 1000 years. Time permitting we will visit the famous Vingerklip rock finger after leaving the forest. From here it is on to our lodge at the foot of Namibia’s highest mountain! The stylish chalets and the bungalows are spread over an area in the river valley amongst large, shady trees and serene landscape. 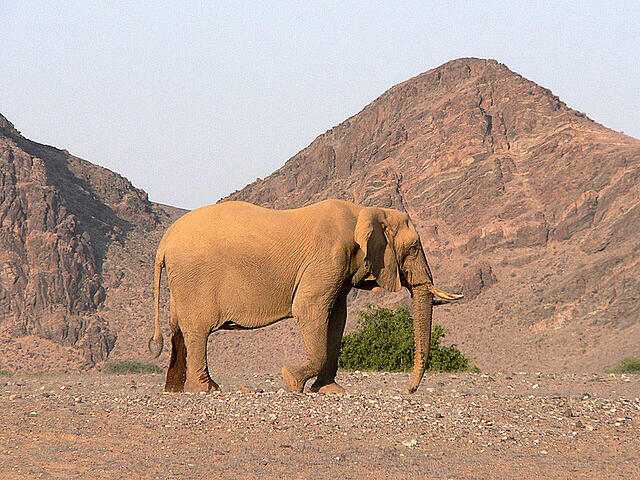 The stone-age rock paintings of the San Bushmen give evidence of the famous desert elephants in the are many thousands of years ago and during the drier periods of the year, groups rove in the valley of the Ugab River. The day begins as by heading further west and then south towards Swakopmund. 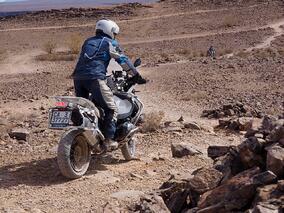 Time permitting riders will want to stop at the Messum Crater. The Crater here is an amphitheater of the desert where there was once an ancient volcano, over 22km across! Now two concentric circles of mountains ring the gravel plains here. It's possible to climb down to the salt pan at the bottom of the crater, where there are also rock engravings. Next stop is ‘The Cabo de Padrao’. The Cape Cross Seal Reserve on the Skeleton Coast, which is home to the largest breeding colony of these seals on the planet, with at times up to 210,000 seals present during November and December months. 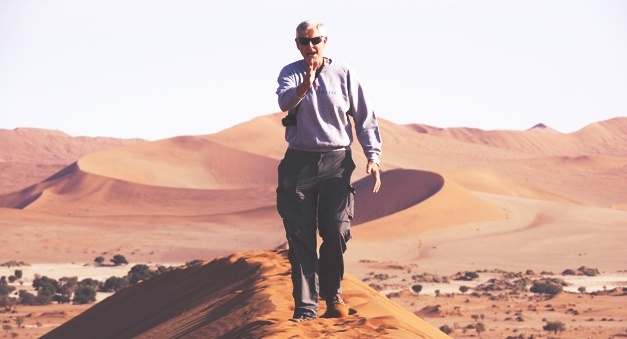 From Cape Cross it’s onward down to Swakopmund, the adventure capital of Namibia! Where palm-lined streets, seaside promenades, fine accommodation, a pleasant summer climate and mesmerizing sand beaches await you! The area of the Namib Desert around Swakopmund is named the West Coast Recreational Area, where you’ll find adventure around every corner! Today is a full rest day to enjoy some of the many activities available in this bustling town! 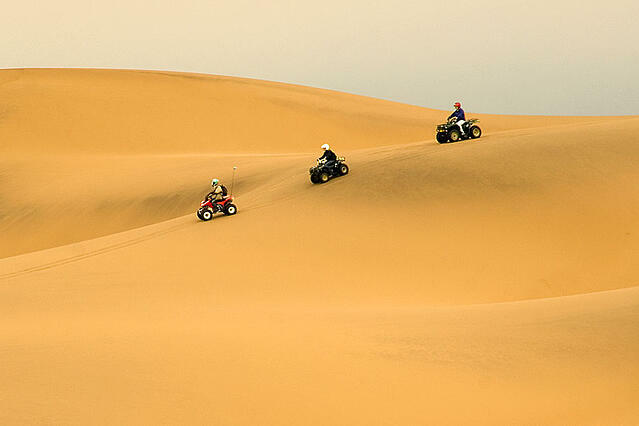 For those interested in adventurous activities, Swakopmund offers sand boarding, quad riding, dune carting, parachuting, hot air balloon rides, deep sea fishing, and beach angling…just to name a few. For the more sedentary, or those admitting they do need a "restful" day, there are restaurants, cafes, art galleries, museums and an aquarium to explore. Needless to say, you won’t have a hard time finding something unforgettable to do on this day in Swakopmund. After breakfast, start your ride even deeper into the shifting landscapes of Namibia, passing endless dune fields and rocky mountain ranges where free-roaming wildlife such as springbok and oryx can be seen amidst the stunning desert scenery. 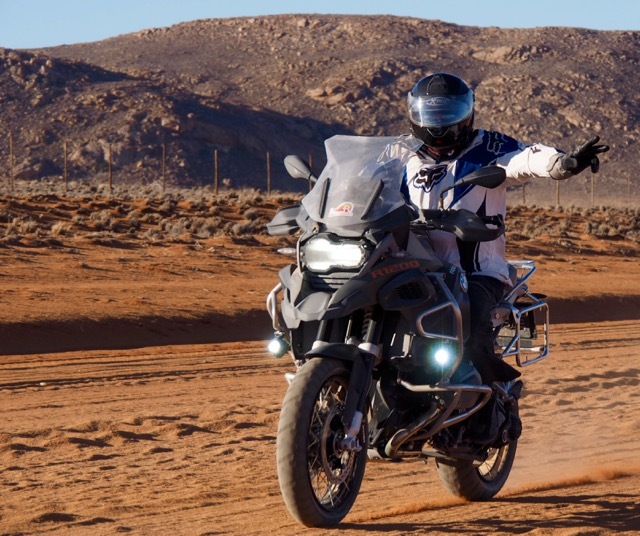 The riding continues through famously-intriguing rock formations and moonscape scenery on the way into the towering sand dunes of Sossusvlei and the gateway to Africa’s largest conservation area: the Namib Naukluft National Park. The park offers some of the most stunning terrain seen anywhere on earth, which includes not only striking sandscapes, but golden grasslands which stretch as far as the eye can see, where you will likely witness herds of antelope grazing along the roadside. Waking up with the sun, instructions are given on how to proceed to the famous dunes of Sossusvlei, as motorcycles are not permitted past the checkpoint. The early morning hours are the ideal time of day to admire the dunes in all their glory, as the contrast of colors is stark, making for a surreal landscape and wonderful photo opportunities. The ‘vlei’ is actually a circular, hard-surfaced depression in the land that is entirely surrounded by sharp-edged dunes, beyond which lies a formidable sea of rolling sand, stretching unbroken into the the distance, all the way to the coast. The mere size of these giant walls of sand is impressive on its own, but what is perhaps more phenomenal is the desert-adapted wildlife that is able to survive in temperatures that surpass 40 degrees centigrade during the day and fall below freezing at night. 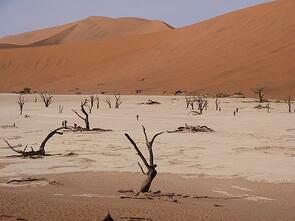 Notice the tiny tracks at the base of Sossusvlei’s dunes which provide evidence of their existence and survival. Desert-dwelling creatures drink droplets of the periodic fog or lick minute drops of water trickling down rocks and plants in order to survive. 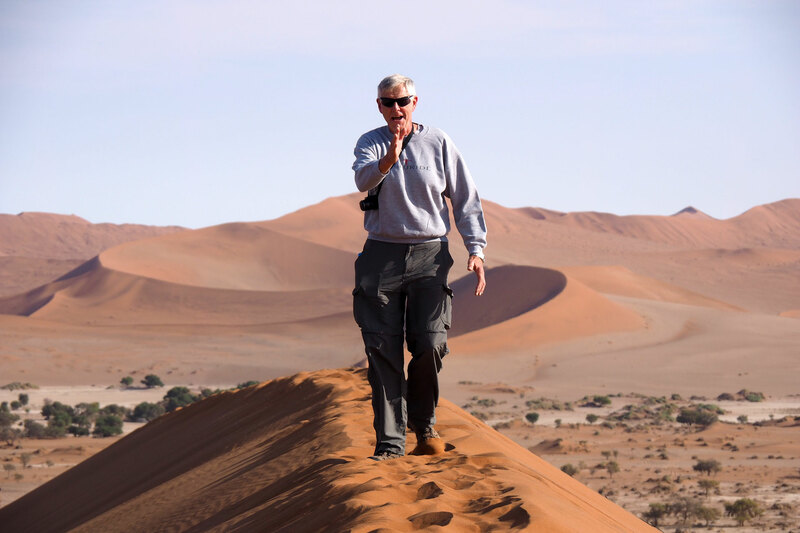 There are also larger tracks which you might come across during your Sossusvlei excursion, black-backed jackal, springbok, and ostrich tip-toe across the dunes frequently. 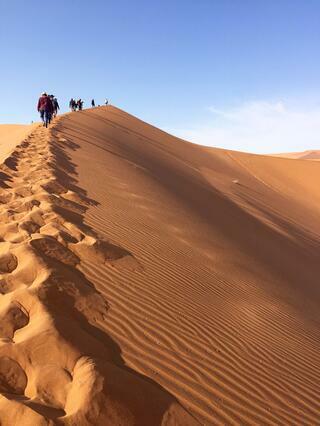 Riders have the option to climb Dune #45 which stands roughly 170 meters high and is composed of five-million-year-old sand accumulated by the Orange River, originating in the Kalahari Desert. The climb to the dune’s summit takes about 30 minutes and affords those who endure the challenge, the most breathtaking desert views around! After conquering Dune #45, a short drive over to experience Deadvlei—a white clay pan formed when the Tsauchab River flooded and created temporary, shows shallow pools where an abundance of water once allowed camelthorn trees to grow. When the climate changed and drought hit the area, sand dunes encroached on the pan, which locked the river from flowing through this area any longer. The camelthorn trees consequently died as there was no longer enough water to sustain life, and the remaining ‘tree skeletons’, which are now roughly about 900 years old, are an unmistakable, charred black due to being intensely scorched by the sun over so many years. With sweeping blue skies above, the piercing red dunes, white clay pan and the contrast of deeply blackened trees, travelers are left in awe of this unforgettable and dramatic landscape. Onward then to explore the geological wonder of Sesriem Canyon— a natural canyon carved by the Tsauchab River in the local sedimentary rock. Eroded over centuries by waters flowing deep into the layers of schist and gravel deposited millions of years ago, the gorge is up to 30 meters deep and approximately 1.5 km long. The name Sesriem means ‘six belts’ in Afrikaans and comes from when settlers returning from the Dorsland Trek tied together six belts (made of Oryx hides) in order to reach buckets down into the canyon to scoop up water. 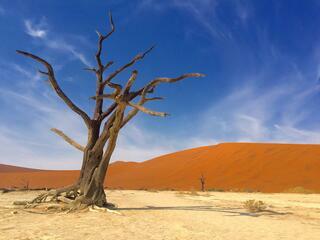 Just two meters wide in some places, it has a portion that permanently contains water, which many animals drink from. A number of trees grow in the canyon and the permanent pools are inhabited by many different species of fish. Jumping into the saddle this morning, your ride continues to the Gondwana Sperrgebiet Rand Park, known as Namibia’s Namaqualand and the most bio-diverse desert on earth. Be extra careful to keep eyes on the road today, as it is easy to be distracted by the beautiful array of colorful flowers and plant life all around. To the east of the park is the Nama Karoo, and to the north, on the dune sea of the Namib, is where the Wild Horses roam—the origin of which nobody can be quite certain. Riding alongside the Richtersveld National Park, you'll eventually arrive for a comfortable overnight stay in Aus to relax and rest up. After breakfast at your included hotel stay, continue the RIDE through an enchanting Namibian landscape to one of Namibia’s foremost natural wonders, the Fish River Canyon. 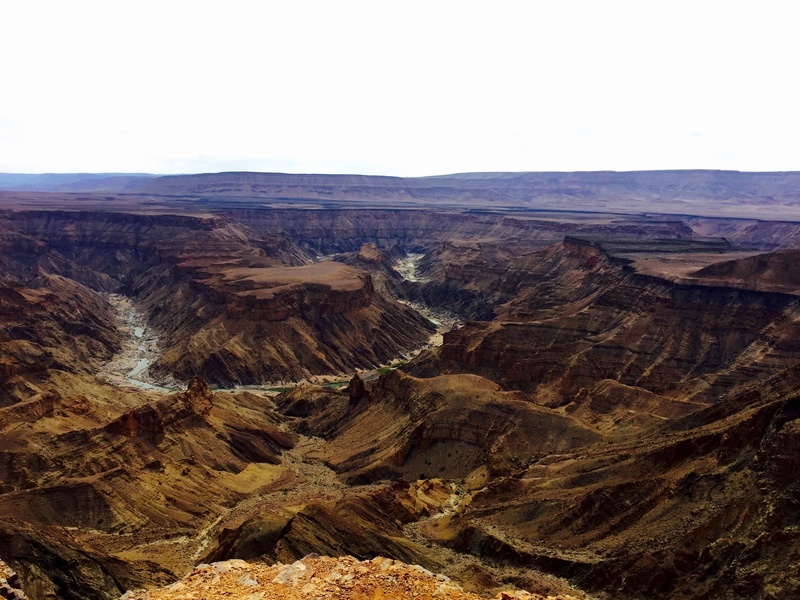 The Fish River Canyon is the second largest canyon in the world after the Grand Canyon, the immensity of this magnificent landscape is nothing short of overwhelming! Stopping at some optimal viewpoints affords marvelous views of the canyon, and great photo opportunities! Measuring 160km in length, 27km in width and 550m in depth, the canyon forms part of the Ai-Ais Richtersveld Transfrontier Park. These towering rock faces and deep ravines were formed aver 500 million years ago by water erosion and the collapse of the valley due to movements in the earth’s crust. Depending on the time of year you visit, you could witnessing a dry riverbed or a raging flow of water. Moving onward to Orange River camp, an early arrival could lend time for some canoeing with the help of staff and local providers, just to swith up the type of "riding" you're doing on this trip. 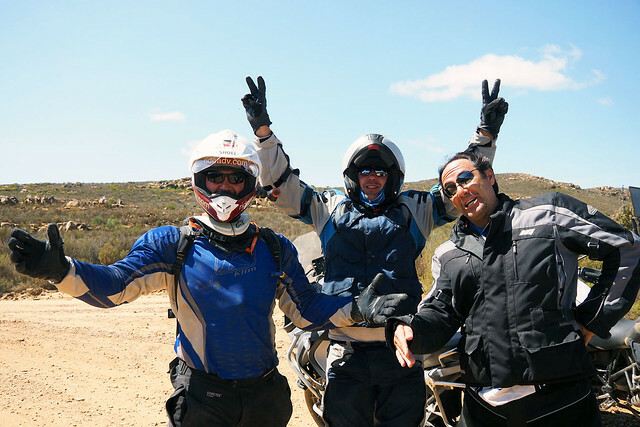 Today's RIDE goes south through the Cederberg, where the Cederberg Mountains provide awe inspiring natural beauty, fascinating plant and animal diversity, unique rocky landscapes and blue skies. The Cederberg Mountains and nature reserve form part of the Cape Floral Kingdom of South Africa, considered by some to be the most bio-diverse in the world! Towering mountains that glow with purple brilliance at sunset watch over ripening citrus orchards in the valley laden with the pungent scent of orange blossom. Sharply defined sandstone rock formations, often reddish in color, characterize this area where important fossils have been discovered in argillaceous layers of shale which is also found here in abundance. The Cederberg’s mountain ranges are globally recognized for their Bushmen rock art created by hunter-gatherers some 6000 years ago. Also among these intriguing rock formations, farmers cultivate the world famous rooibos tea, grown nowhere else in the world. Time permitting, take a break for lunch in the historic Cape Winelands town of Tulbagh before stopping briefly in Table View to get some photographs of Table Bay, where the glorious Table Mountain lays as the backdrop. 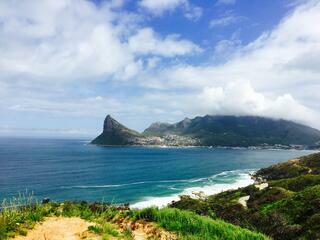 This unimaginably exciting and fun ride South, takes you right into the gorgeous Cape Town. cape The breathtakingly scenic metropolitan city at the tip of Africa will simply amaze you, it is a fascinating melting pot, alive with creativity, colors, sounds and tastes, all surrounded by the allure and sparkle of the Atlantic Ocean. It’s hard not to be impressed by the Mother City’s impeccable beaches, award-winning wine estates, slick city centre and of course, the latest additions to the World’s Natural Wonders—Table Mountain. Beneath this grand and iconic landmark is a multitude of five star restaurants, curio and craft markets, compelling museums, art galleries and a vibrant nightlife. One of the trips most rewarding and unforgettable rides begins this morning. Start by taking Camps Bay Drive out to Chapmans Peak and following the road as it winds it’s way between Noordhoek and Hout Bay. Situated on the Atlantic coast at the south-western tip of South Africa, this is one of the world’s most spectacular marine drives, offering stunning 180-degree coastline vistas and many viewing points along it’s course. Nine kilometers inlength, the 114 curves of this road skirt the rocky coastline at 593 meters above sea level, offering a ride you'll be talking about for years to come. Known affectionately as ‘Chappies’, this elegant piece of road is a paradise for sightseers, picnickers, runners, hikers, and of course, motorcyclists! You will have the opportunity to stop and take photographs from your privileged position above the ocean with exquisite views of Robben Island and the Sentinel off the coastline of Hout Bay. Taking Ou Kaapse Weg (Old Cape Road)— which although today is a highly modernized road, was an old wagon road to cart ore from the nearby silver mine in the 1800’s—all the way to Kommetjie with it’s unique blend of beach, mountains, sea and surf! Enjoy lunch at Fisherman’s restaurant where you can eat under the shade of giant Milkwood Trees. Next on this incredible local riding day is Cape Point, which lies at the tip of the Cape Peninsula, 60km south-west of Cape Town. This nature reserve falls within the Table Mountain National Park and is the half way point of your day’s ride! The Cape of Good Hope, just 2km away is a rocky headland which first was navigated by Portuguese explorer Bartolomeu Dias in 1488 and was a milestone in establishing direct trade relations with the Far East. Later passing Boulders Beach, it's not only one of the most sheltered beaches Cape Town, but also home to a huge colony of African Penguins which have lived here since 1982. 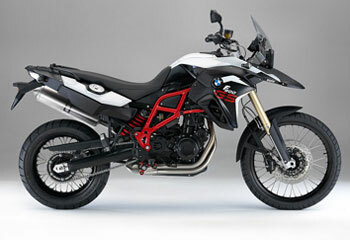 As this was the last scheduled day of riding, instructions will be given regarding the return of your rental motorcycle. While the motorcycle riding part of your trip may be over, please keep in mind that these Self-Guided "Fly & RIDE" packages can be customized. So if you'd like extra days/nights in Cape Town to explore and enjoy this beautiful city, please make sure you've told us at the time of booking. Otherwise, it's time to head to the airport, and prepare your presentation of all these photos and adventure riding stories to your motorcycle riding friends! 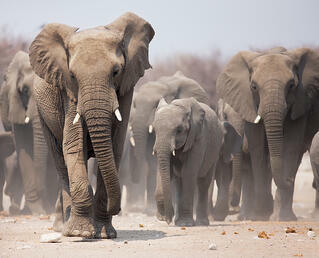 Take a look at some of our other African motorcycle tours. 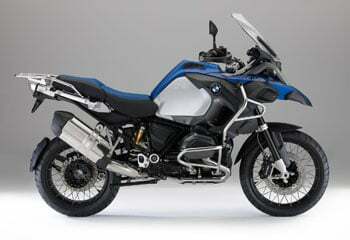 Got Questions About This Motorcycle Tour?